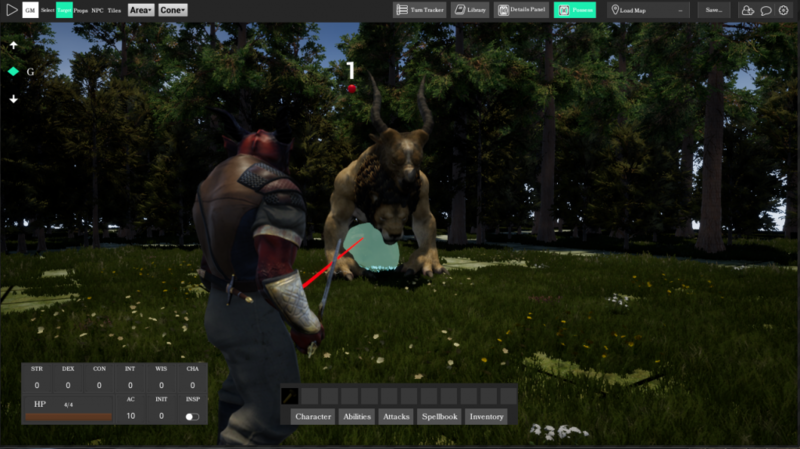 Targeting system is now available for both players and GM’s, by using the targeting tool you can select individual monsters or multiple at the same time. Notification system for the GM is now available. Whenever a monster is targeted and a weapon attack is used, the GM will receive a notification which outlines the person performing the attack as well as who they attacked. A GM can apply the results or deny them, even modify them if they wish. Upon applying the results, the attacked monster will perform a dodge animation if they were missed or an impact animation if they got hit. Fully automated mode can be toggled on (off by default), this makes it so the GM does not receive notifications, instead the result is automatically applied. Mode can be toggled in the in-game menu. Character builder alpha is now available for public testing, try out all of the customization options! A limiter now exists inside of the details panel for GM’s, this limiter will let you know how many tiles/props/npc’s are in your world. For the time being this number cannot exceed 10,000 if you wish this map to be used in a live game. Keep an eye on the Limiter as you build out your worlds. The builder area has been modified, it’s no longer a golden brown. It is now very defined. GM’s can now load maps in live games without breaking the characters of connected players, this allows a GM to create worlds with as many maps as they wish that can be loaded during gameplay for transition between places. Cyclops was not an SRD monster and got removed. Placing grasslands across non grasslands tiles will create grass over other tilesets if they intersect. Tiefling female tail does not behave like a tail. Some tilesets will not build properly if they overlap on different levels.